In Bonga one finds the ideal personification of Lusophone culture. His art is one of the best expressions of the cultural and geographic breadth of the Portuguese speaking Diaspora. His Angolan musical outlook mixes with a Brazilian approach and a sentimentality that is very much Portuguese. 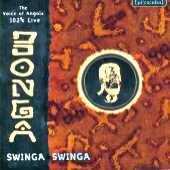 Recorded 102% live at Heimatklänge-Festival in Berlin this records holds not only the appeal of the unique voice of Bonga but also reveals his unique way of communicating with his devoted audience. Lets go people! Swinga, Swinga!